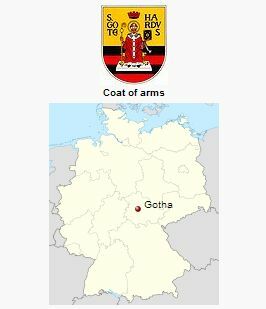 Gotha, a city (1955 population, 57,639; 2012 population, 44,371) and former duchy in Thuringia, Germany, where the Anabaptist movement attained a considerable strength soon after its origin. The events that took place here are of particular interest, because here the reformers for the first time advocated the death penalty in religious matters. The first official records date from 1526; in that year a member of the brotherhood had been baptized. But the movement apparently did not attain any great significance in the duchy, because it was nipped in the bud by the extraordinary severity of the measures used against the new brotherhood. The suppressive measures began in 1529. Near Gotha, in Reinhardsbrunn near Friedrichsroda, ten persons were arrested "on account of unchristian error toward God, also seriously offensive and seditious plans against their proper government and its subjects," but were released when, after instruction, they gave up their doctrine. Nothing more was said about their "seditious plans." The instructions, however, did not hold, for they soon returned to their brotherhood. Early in 1530 they were therefore again arrested. The cross-examination revealed that they had been conscience-stricken for recanting. Thus Christoph Ortlep, who had been first taught by his cousin Balthasar at Gräfenhain, a village in Sachsen-Gotha, and who had been baptized by an elder named Michael of Uettingen, a village near Marktheidenfeld in Lower Franconia, stated that the doctrine of his brotherhood was the most thorough truth, and that he would give his life for it. He did not regret having to endure the punishment imposed upon him as shame for the sake of Christ; but he did regret recanting and denying what he recognized to be the truth. After examining each prisoner separately, the judges tried to influence them with admonitions and threats. Out of unusual sympathy—says the court record—the council advised the prisoners "to consider what great danger and ruinous harm would visit them both in body and soul against God and their government out of their obstinacy and unchristian intentions, and also that they were bringing God's judgment, wrath, and anger to their hearts, which would not, like temporal punishment, affect only the body for time, but soul and body for eternity." They were given two or three hours for reflection; then new attempts were made to convert them, with the result that three prisoners recanted, while Christoph Ortlep and Andreas Kolb, as well as four women, Elsa Cutz, Barbara Unger, Katharina König, and Katharina Kolb, declared that they would persevere in their faith. There is no mention in the record of the trial of any offense against civic order. Nevertheless the six who did not recant were executed a week later, 18 January 1530. The execution caused a great stir, for it was not a matter of sentencing common criminals to death, but of using the death penalty against dissent in matters of faith in a Protestant country. The leading theologians found it difficult to calm people's minds. Superintendent Justus Menius in Eisenach tried to remove the doubts in a book, Der Widdertauffer lere und geheimnis (Wittenberg, 1530), for which Martin Luther wrote a foreword. He asserted in it that these people "were sentenced not alone because of manifold and abhorrent blasphemy and seditious articles of these mobs, but also because they created a public tumult among the people in one of the churches by trying to stone one who was about to renounce their doctrine; and several other transgressions through which they fell into government hands." Any statement describing the nature of the blasphemies Menius omits; nor does he give any information about the civil offenses. From his further discussion it is, however, clear that the latter would not have been stressed if they had recanted. They were simple people, who could not express or defend their faith in learned terms. As the record states, they did not enter into an analysis of their faith, and Menius says of the attempts to convert them, "They found nothing to criticize in our instruction .... They also permitted themselves to be instructed. But what shall I say? Before one was aware of it, they fell again and said that although they were unable to show sure Scriptural foundation for their doctrine, there were others who knew it." Nor did Philip Melanchthon hesitate to sanction the sentence. He wrote in February 1530 to Friedrich Myconius, the superintendent of Gotha, who had some qualms of conscience concerning these executions, that he regretted that he had not advocated the death sentence for Nikolaus Storch, "from whom all these sects of Anabaptists and Zwinglians emanated." He even suggested to Myconius that he intimidate the people with new examples of punishment. Seven years later at the duke's command, a woman of Gotha, Christina Strobel, was executed by drowning in die Unstrut between Mühlhausen and Ammern on 8 November 1537, with seven other women from Mühlhausen and Frankenhausen, when they refused to recant. Anabaptism was unable to propagate itself further in the vicinity of Gotha. Hege, Christian and Christian Neff. Mennonitisches Lexikon, 4 vols. Frankfurt & Weierhof: Hege; Karlsruhe: Schneider, 1913-1967: v. II, 147 f.
Hege, Christian. "Gotha (Thuringia, Germany)." Global Anabaptist Mennonite Encyclopedia Online. 1956. Web. 19 Apr 2019. http://gameo.org/index.php?title=Gotha_(Thuringia,_Germany)&oldid=145282. Hege, Christian. (1956). Gotha (Thuringia, Germany). Global Anabaptist Mennonite Encyclopedia Online. Retrieved 19 April 2019, from http://gameo.org/index.php?title=Gotha_(Thuringia,_Germany)&oldid=145282. Adapted by permission of Herald Press, Harrisonburg, Virginia, from Mennonite Encyclopedia, Vol. 2, p. 553. All rights reserved.